The Gringo Gourmet has a new look with an easier to read color scheme. Please feel free to comment on it. The end of the year us always hectic and 2017 was no exceptions. A number of things got me way behind in posting here. One of my New Year’s Resolutions is better organization of time and tasks and more posting here. Wish me well on that one! 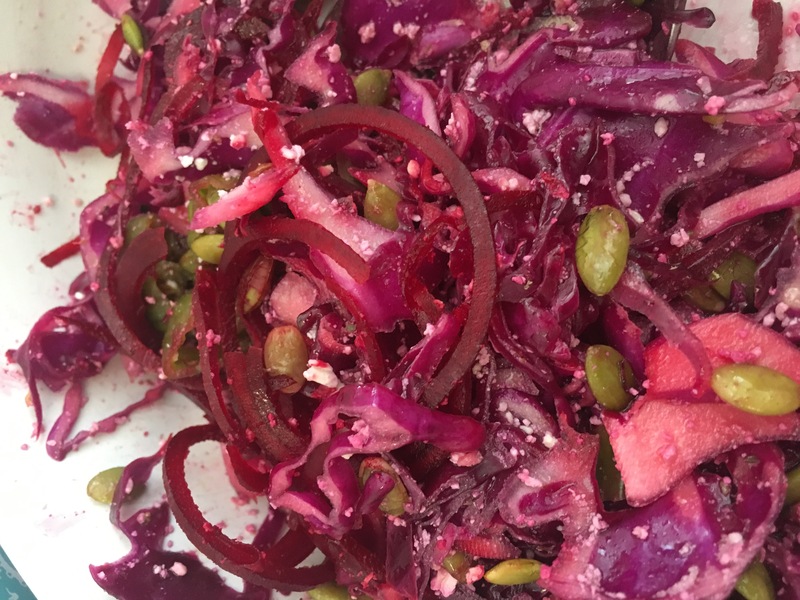 I’ll start off with a recipe for an amazing and colorful slaw that looks and tastes as bright as fireworks welcoming in the new year, even if I’m doing it a couple of days early! In the next day or so I’ll post an interesting vegan dish we made for Christmas. It was a recipe from Jamie Oliver and all the measurements were metric. Fortunately, my daughter had a scale that could to metric weights as well as the weights we are used to in the U.S.! Keep an eye our for that one. My pre-happy new year treat was part of a birthday party for one of my great grandnieces who turns 3 on New Year’s Eve. (Note: I have 10 great grand nieces and two great grand nephews. The consensus is I am a great, great uncle!) There was a luncheon featuring brisket, beans, fruit, guacamole, chips and salsa. Good TexMex eating on the border. I made a standard Cole slaw with a. creamy dressing and then, go fiesta with a Red Slaw with Spiralized Beets. Red Slaw with Spiralized Beets. Even when they heard the word “beets”, they seemed to like the salad! In a large bowl, whisk together lime zest and juice, oil, garlic, cumin, salt and pepper. 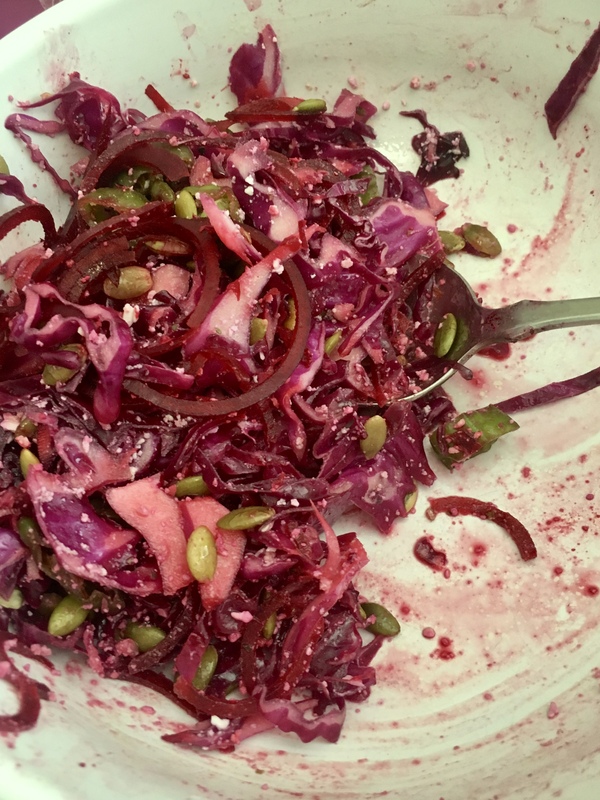 Spiralize beets; add to dressing. Add cabbage, scallions, shishito peppers and oregano to beets; toss to coat. Sprinkle with cheese and pepitas. Garnish with a few additional spirals. Who’d a Thunk It… Cauliflower = Seafood? Happy New Year to you and all the family!